The most common symptom of acid reflux is a burning sensation in the lower chest area. This sensation can sometimes be described as pain in the chest and can be worsened by bending over or laying down after eating. GERD patients will also often describe regurgitation as a common symptom, a sensation that occurs from acid backing up into the esophagus. Other less common symptoms that a person may experience include an acidic or sour taste in the mouth, sore throat, nausea, and painful swallowing. 1 What are the Symptoms of Acid Reflux? 1.3 When do the Symptoms Occur? 1.4 What are Common Food Triggers of Acid Reflux? 1.6 When to Ask for Medical Help? The three most common signs of acid reflux are heartburn, dyspepsia and regurgitation. 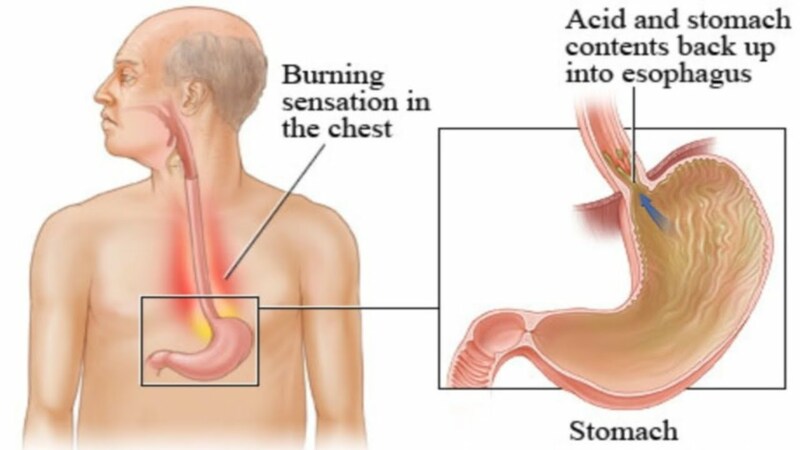 Heartburn is the most common symptom of acid reflux and is identified by a burning sensation in the lower chest area. This symptom was given the name heartburn because most individuals will describe this symptom as a burning sensation close to their heart. In reality, this sensation stems from the lower esophagus which is located in the lower chest area and can also occur at higher points of the esophagus toward the throat. People with acid reflux, especially the chronic variant GERD, often suffer from dyspepsia simultaneously. Dyspepsia, or indigestion, is the sensation of stomach discomfort characterized by stomach bloating, burping, stomach fullness, and nausea. This most often occurs immediately after consuming food. Regurgitation is the sensation you get when the acid backs up all the way into the mouth or the throat. When this symptom occurs, people experience a bitter taste and a so-called ‘wet burp’. In some cases, you can even vomit. Heart palpitations, or the feeling of your heart skipping a beat, is often associated with GERD. Although some people can experience these symptoms simultaneously, they are not likely linked. Several factors can trigger both symptoms of GERD and heart palpitations such as caffeine or alcohol intake, pregnancy, and smoking, but GERD is unlikely to cause palpitations directly. Feeling anxious or worried about symptoms of GERD can also trigger heart palpitations. Speak with your doctor if you are unsure about your symptoms. If you experience severe symptoms, seek medical attention immediately. The most common trigger of acid reflux is consuming a large meal with spicy or high-fat foods. These symptoms can be worsened by laying down immediately after a meal or doing physical work such as lifting heavy objects immediately after a meal. Symptoms of acid reflux are also common for women during pregnancy due to the increased pressure from the fetus on the stomach. In the majority of cases of acid reflux during pregnancy, the symptoms will stop after the baby has been born. What are Common Food Triggers of Acid Reflux? In most cases, acid reflux can be well managed and will not result in complications. In more some cases where acid reflux is chronic and more severe, complications may occur as a result of damage to the esophagus and surrounding tissues. Esophagitis: Esophagitis is characterized by inflammation of the esophagus and occurs when the lining of the esophagus becomes irritated and inflamed from exposure to stomach acid. Esophageal Ulcer: stomach acid can wear away at the esophagus, eventually leading to an ulcer. An Esophageal ulcer can bleed and make swallowing painful. Esophageal Stricture: a stricture can be caused by a buildup of scar tissue as a result of chronic acid reflux. This causes a narrowing of the esophagus and can make swallowing difficult. Barrett’s Esophagus: Barrett’s Esophagus is a mutation of the cells of the esophagus that can occur as a result of severe acid reflux. In this condition, the tissue that lines the esophagus is replaced by tissue that resembles intestine lining. This condition is uncommon but can occur in people with GERD. Barrett’s Esophagus is associated with an increased risk of esophageal cancer and requires regular monitoring. Respiratory problems: respiratory problems may occur as a result of stomach acid from the esophagus entering the lungs. This can cause symptoms including difficulty breathing, asthma, coughing or wheezing, or infection. In many cases, simple changes can be made to help manage acid reflux in babies and infants. Feeding the baby in an upright position and ensuring that the infant is sitting upwards for 30 minutes after meals can help reduce the chances of reflux. Some doctors also suggest thickening formula with rice cereal to reduce reflux. Be sure to speak with your pediatrician if you are concerned about symptoms of reflux. In older children and teens, acid reflux symptoms can be similar to that of an adult, including heartburn and indigestion. In many cases, diet and lifestyle changes can be made to help manage acid reflux in children. Limiting spicy foods, carbonated beverages, citrus fruits or beverages can help reduce reflux. Offering healthy snacks between meals to reduce portions at meal time can also help reduce the chances of reflux. If your child experiences nighttime reflux, ensure that your last meal of the day is 3 hours prior to bedtime to allow food to digest before the child lays down. The Frequency pf Barret’s Esophagus in High Risk Patients with Chronic GERD (2005) https://www.ncbi.nlm.nih.gov/pubmed/?term=176.+Westhoff+B%2C+Brotze+S%2C+Weston+A+et+al.+The+frequency+of+Barrett%E2%80%99s+esophagus+in+high-risk+patients+with+chronic+GERD.+Gastrointest+Endosc+2005%3B61%3A226%E2%80%93231.